Marlon Mundt, PhD, above left, and Matthew Swedlund, MD, above right, investigated how team-based primary care delivery could be improved using human factors approaches. Their study appeared in the December 2016 issue of Family Practice. It builds on an earlier study published in the Annals of Family Medicine. 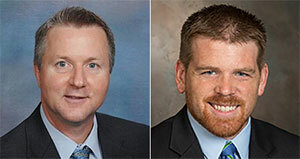 A recent study by the Department of Family Medicine and Community Health’s Marlon Mundt, PhD, and Matthew Swedlund, MD, argues that focusing on personal relationships among staff, teams’ electronic health records use, physical environment, communication and organizational support could empower primary care teams to deliver better patient care. The study, published in the December 2016 issue of Family Practice, uncovered team work system components that impact primary care team performance. Data for this research come from an earlier study of team communication networks in primary care clinics. For the current study, researchers invited 155 clinicians and staff at six UW Health primary-care clinics to complete a face-to-face survey on communication patterns. Of those, 19 participants (three to four clinicians and staff at each clinic) who had the highest number of communication connections participated in an additional qualitative interview on communication, team climate and overall teamwork. The interview questions brought to light valuable team work system components related to primary care team function and quality of care. the influence of clinic managers’ leadership style and the impact of policies or mandates from the larger organization. “I think we are all eager or willing to get up and jump in if we can see that someone is getting behind or if something needs to be done we are helpful to each other and share knowledge and ideas,” said one interview participant. “I think face-to-face communication is probably the best if you need to talk to somebody about an issue or a question or anything like that,” said another. Participants also noted that they believe team cohesion contributes to better patient care, that team climate contributed to work-life quality outcomes and that high turnover contributes to a lack of team cohesion. According to the researchers, focusing on relationships among staff, teams’ electronic health records use, physical environment, communication and organizational support will help individual team members better understand their roles and think through all of the care elements that affect patient outcomes. Carefully examining multifaceted dimensions of team functioning at a system level allows practitioners to understand better how these individual elements of their team’s work system contribute to team climate and high-quality care—and where improvements could be made. For example, deliberate evaluation of the team’s work system components could help guide decisions about how to use technology more effectively, how to improve the physical environment, how tasks get done, how leadership can support the team’s mission, and what behaviors support the team’s performance. “Targeting team work system components will help us find new ways to unlock the power of primary-care teams to lead the charge of quality improvement efforts and to drive value-based care solutions in primary care,” noted Dr. Mundt. Learn more about the UW-developed SEIPS model that informs their work.